To explore how to craft Instagram stories for business, I interview Sue B. Zimmerman. 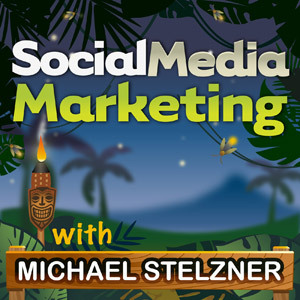 In this episode, I interview Sue B. Zimmerman, an Instagram marketing expert who helps businesses and marketers take their Instagram marketing to the next level. She’s the author of the Instagram Strategy Guide ebook and a regular speaker at Social Media Marketing World. Sue shares how a number of businesses are creating engaging Instagram stories. You’ll discover several techniques to improve your own Instagram stories. 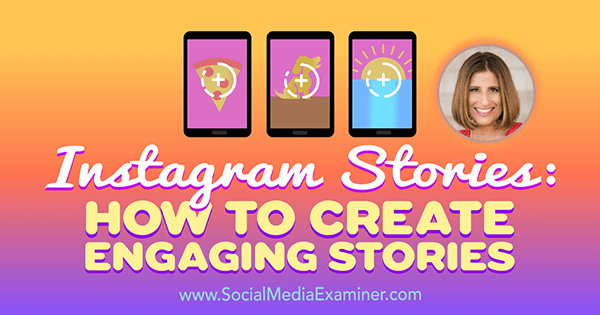 Instagram Stories: How to Create Engaging Stories featuring insights from Sue B. Zimmerman on the Social Media Marketing Podcast. Sue started using Instagram Stories as soon as the feature rolled out in 2016. She still uses Snapchat, but she says now she mostly relies on Instagram Stories. She says pulling together content to tell a story is creative work, similar to scrapbooking. Sue recommends that you develop a thread that keeps people engaged in your story from start to finish. Also, create Instagram stories with content that’s original to Instagram, rather than duplicating content from other platforms. Press the home button and then the camera icon to create an Instagram story. Stories that are entertaining and engaging give your followers a quick and easy way to consume your content. Engagement is important to the new algorithm that determines what people see in their Instagram feed. 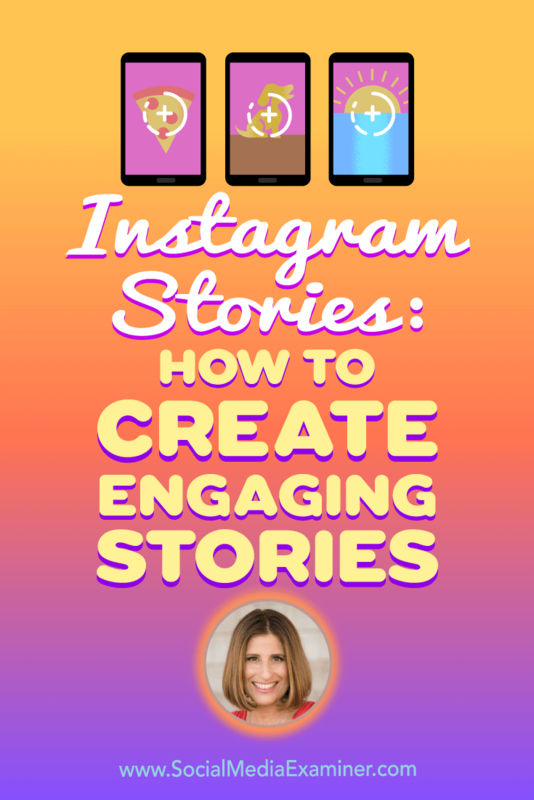 Because Instagram stories boost engagement with your Instagram posts, they improve your chances of showing up at the top of people’s news feeds. Listen to the show to discover when Sue still uses Snapchat instead of Instagram Stories. We talk about the highly produced content that marketers often feature on their Instagram feeds, and Sue says high production value is not necessary for Instagram stories. Sue shares a few examples of businesses that use Instagram stories in creative ways. These businesses create stories that are different from the content in their regular Instagram feeds. For example, Jenny Schatzle, who owns a gym in Santa Barbara, uses Instagram stories to let people know when she’s starting new sessions. Her stories are more like ads, which is a completely different approach than her regular posts on Instagram. Sue has also seen companies with products (such as shoe company M.Gemi) use stories to feature sales and direct people to their Instagram feeds. Bring attention to time-sensitive information, like a sale, through Instagram Stories. Sue notes that marketers use text differently on Instagram posts and stories. 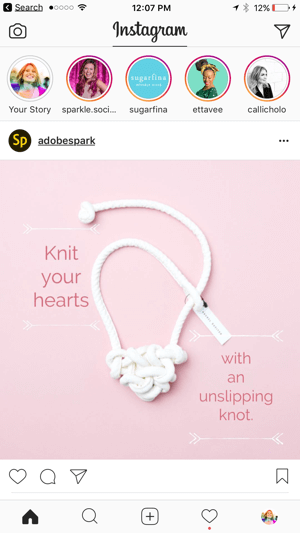 The more successful accounts on Instagram typically include the text in the description, not on the photo itself, so people connect with the experience of the product or service that the photo depicts. However, in an Instagram story, text can add value. People who don’t have the volume turned up in the story can read the text on the video or the photo. I ask how Instagram Stories has changed the way people interact with content on Instagram. Sue shares a few changes she’s noticed since the release of Instagram Stories and the algorithm change. Although she’s been posting less frequently on Instagram, Sue gets more engagement with her posts over a longer period of time. She attributes that engagement to having active Instagram stories. People discover Sue through her stories, which provide value. Then people go to her feed and comment on and like her photos. She likens an Instagram story to a broadcast reel of your Instagram feed that can drive engagement. When I ask whether people prefer the video or still image component of Instagram Stories, Sue says people are using the Stories features in a variety of ways. People who aren’t comfortable on camera do creative text overlays using the writing tools, stickers, and emojis. In general, Sue thinks regardless of whether you use text or video, dynamic and entertaining stories get more click-throughs. For example, people are using the text tools in creative ways to keep people clicking through each four-second image clip. Sue emphasizes that when people feel like they’re with you, they want to stay until your story is done. New fans discover Sue’s Instagram feed through her stories. As you develop Instagram stories, Sue notes that you need to be aware of how the text and video formats work. Photos always display for four seconds (whereas you can change that time frame on Snapchat). Videos are a maximum of 10 seconds. You can move backward or forward and pause a story. In a video, Sue writes a note asking viewers to turn up the volume because otherwise, people won’t hear what she has to say in her video. Sue and I talk about the data Instagram shares about your story viewers. You can see which accounts watch each clip in a story, and Sue recommends you focus on the people who view your story until the very end, especially the people who comment and reply to your stories. Sue believes the people who are responding to your Instagram stories (not just watching) are the ones with whom you can ultimately have an intimate conversation. Those people are your superfans, your buzz agents, the people who talk about you. Sue connects with these viewers through a private direct message such as a thank-you message. To thank those who say they like her content and why, she’ll often send a video as her direct message because she believes being real and authentic helps her connect with those viewers. Private messages live forever, so the conversation you have with that individual is in a thread that continues as you build a relationship. Listen to the show to hear why and how to make businesses, products, and locations part of your Instagram stories. Sue shares four types of businesses that are using Instagram Stories well. The North Face showcases people using their product (such as a jacket) so viewers get a sense of their product in use. For example, you see people wearing the jacket while they’re snowboarding or skiing and on a running toddler. In their Instagram stories, The North Face features people of all ages using their products. 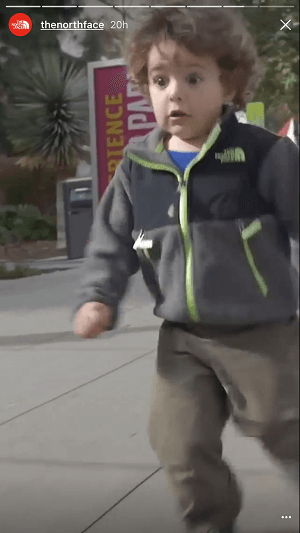 Another account Sue recently discovered is JugglinJosh, a very entertaining juggler. To learn what types of videos he should try doing again, he asks followers to tag him in their favorite clip. 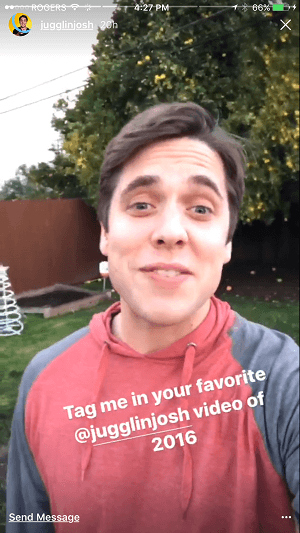 JugglinJosh asks his audience to vote for their favorite videos of him through tagging his posts. Boston photographer 617Images uses Instagram stories to give viewers a behind-the-scenes look into setting up the perfect Instagram photo. Everyone loves to know how things are done and a lot of work goes into those Instagram-perfect pictures. Sue thinks this inside look is a clever way to use Instagram stories. Finally, Sue loves Chase Jarvis, the founder of CreativeLive. Chase, who wasn’t even on Instagram a year ago, has embraced the platform and does stories on a regular basis. Chase excels at personalizing and humanizing his stories, while driving traffic to his YouTube videos. Because he’s verified on Instagram, his account can link directly to his YouTube channel. Listen to the show to hear our conversation about becoming verified on Instagram. Sue created a color palette for her brand, making her Instagram stories easy to spot. When she draws or writes text that enhances a story, she uses only one of three colors. To choose colors that are consistent with your brand, you can press and hold one of Instagram’s 27 colors to see additional color options. Choose from three different writing tools and 27 colors for your Instagram stories. For the content of each story, make sure you have a beginning, middle, and end. If you can’t map out a story in your head, Sue recommends storyboarding with sticky notes. Also, think about how you’re going to entertain, educate, and inspire in some way that gives value. Sue believes Instagram stories should be quality over quantity. Create stories with intention and strategy. Additionally, Sue recommends you align your stories with whatever you’re posting on your feed to draw more eyeballs to it. That’s adding even more value for you. Align your stories with your Instagram feed. The maximum length for an Instagram story is one minute, but Sue recommends keeping your stories a bit shorter. For video clips, you don’t need to use the whole 10 seconds. Small bursts of content work really well. To build a text story, Sue has had success writing copy that develops her point while using the same photo in each text clip. For a video, Sue suggests starting from an interesting point of view (focus on an interesting subject or visual, like a tree or the sky), and then walk into the frame. Or start with the camera up high (or down low) and then bring it to your face. The effect is like panning in a movie. In both text and video stories, Sue introduces herself and says, “Hey Instagram. 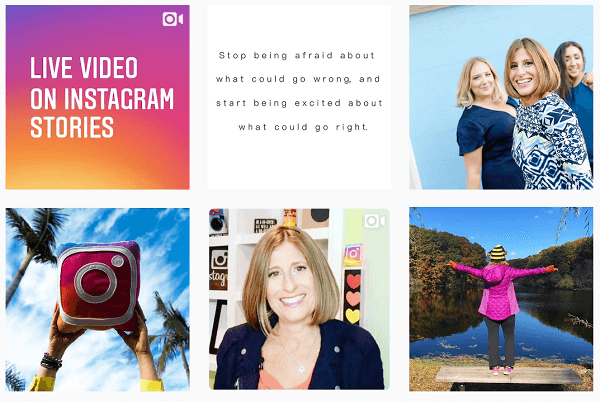 Here I am and here’s what I’m going to talk about today.” Then she’ll write or say, “Tap.” She builds each Instagram story toward an end goal. An end goal might be to get more eyeballs on your blog, grow your email list, or get subscribers on YouTube. Sue typically uses stories to direct viewers to her Instagram Strategy Guide or a blog post. Listen to the show to discover how many new followers Sue gets each day. Instagram Stories includes a bunch of cool Snapchat-like updates, such as stickers and frames, which Instagram rolled out during the holiday season. Users could tap the special holiday stickers to turn them into another version of the sticker. For instance, you could turn a regular Christmas tree into a cactus or a white Christmas tree. I asked Sue for her thoughts about marketers using stickers. Sue says that when a sticker makes sense with your content, the sticker can give your content a little extra creativity so it stands out. One of Sue’s favorites is the Location sticker. 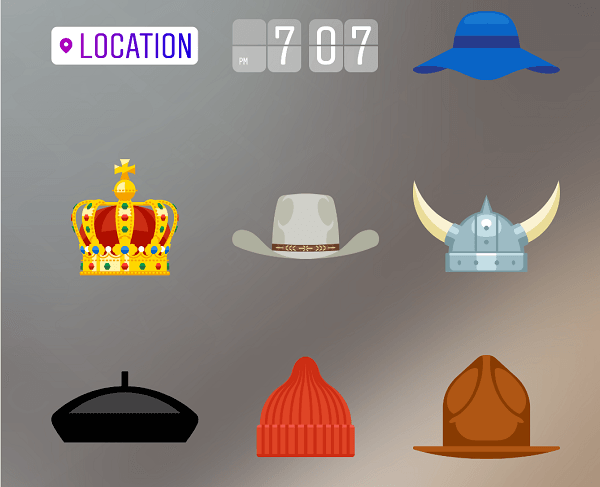 Instagram has a variety of stickers to add to your stories, including a Location geotag. 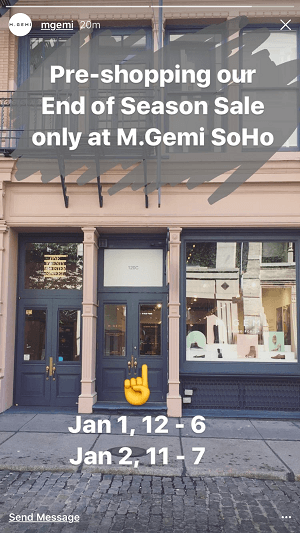 When you select the Location sticker in your Instagram story, you can geotag where you are, which is especially great for businesses with a physical location. Another sticker option is Time of Day, which is great for letting people know you’re doing something at a specific time. Sue doesn’t think stickers are gimmicky, as long as you use them in the context of the story. The sticker content can make you stand out. Listen to the show to hear the suggestion Sue gives me for using Instagram stories to promote our Friday morning live Social Media Marketing Talk Show. Sue runs through several of her ninja tips, starting with Hyperlapse from Instagram. Use it to speed up your video. Then save it to your camera roll and upload it to your Instagram story. Boomerang creates a one-second GIF within the app. The GIF can shake up your story and make it fun. Sue has created a Boomerang GIF in which she points her finger to draw attention to something. Others have used it for holding up a mug, taking off a hat, and so on. The GIFs are a quick little second and they’re entertaining. With another cool app called Flipagram, you can create a 10-second video of photos for your Instagram story. For instance, if you just met 10 amazing people at a conference, you don’t have to upload 10 photos to your Instagram feed. Instead, create and upload a Flipagram video. Any clip in your story can be shared in your Instagram feed, Sue adds. Just edit it within the app. Music is another thing that adds creativity to your Instagram stories, especially if it plays a part in your branding. Music can give your story energy. Text formatting is also important. Instagram Stories lets you choose the text size, color, and line spacing. 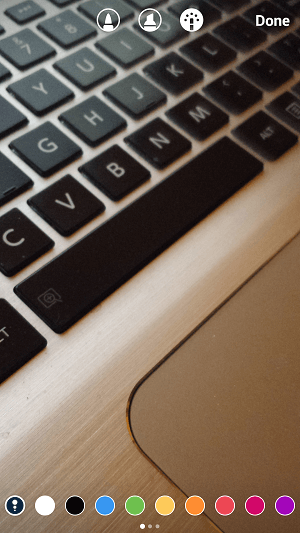 Keep your text formatting consistent as part of your business branding. Finally, you can use any emoji or symbol you want on Instagram, as long as it’s part of your branding and not gimmicky. Sue thinks emojis can work with anybody’s business to some degree. For example, if you have a certain link to a download or webinar, point an arrow or a finger emoji to the link as a subtle call to action. Listen to the show to learn what text on Instagram stories previously looked like. Learn more about Sue on her website and explore her blog. Get Sue’s Instagram Strategy Guide. 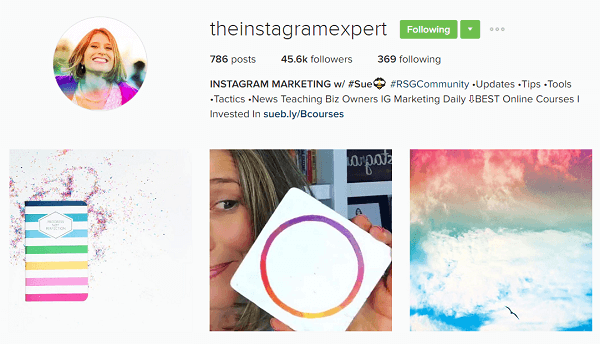 Follow @TheInstagramExpert and @SueBZimmerman on Instagram. Leave Sue a comment on @TheInstagramExpert or @SueBZimmerman that you heard her on the podcast and tag @smexaminer. Check out Instagram stories from Jenny Schatzle and M.Gemi. Take a look at The North Face, JugglinJosh, 617Images, and Chase Jarvis on Instagram. Watch Chase Jarvis’ YouTube channel. Read about Instagram’s holiday stickers. Explore Hyperlapse, Boomerang, and Flipagram. What do you think? What are your thoughts on Instagram Stories? Please leave your comments below.